Chef Tamara created Simply Thyme Catering in 2006 to provide catering services for social and corporate events, but soon found her catering was in demand by private jets and charter businesses. Since then, Simply Thyme Catering has grown exponentially, with over 1,600 events catered per year. Chef Tamara invents fresh, creative, and innovative menu options and needed a modern, reliable, and accessible website to promote her talents. She also needed an e-commerce solution so her clients could purchase her signature items online. Simply Thyme Catering’s existing website wouldn’t support her growing business. Chef Tamara need a design agency that would listen to her needs and goals and use that knowledge to build a website that would act as a valuable business tool. The challenge for Ichor Studios was to help Chef Tamara expand her business to reach a newer, younger clientele – like young couples looking for wedding caterers. The website also needed easy-to-use navigation for her existing clients who are less tech savvy. An intuitive e-commerce feature was also essential, because Simply Thyme Catering wanted the ability to make their signature products such as jams, gift baskets, and t-shirts available for purchase online. We listened to Chef Tamara and helped Simply Thyme Catering tell their story by finding inspiration in their dedication to using fresh, local ingredients. Our design solution was a website that invoked crisp produce, bright herbs, and savory dishes. And by using professional images, smart font-pairings, and an easy navigation, we made her website easy for users to find and engage her services. In addition, our in-depth market analysis identified ways Simply Thyme Catering could develop their business over the long-term. 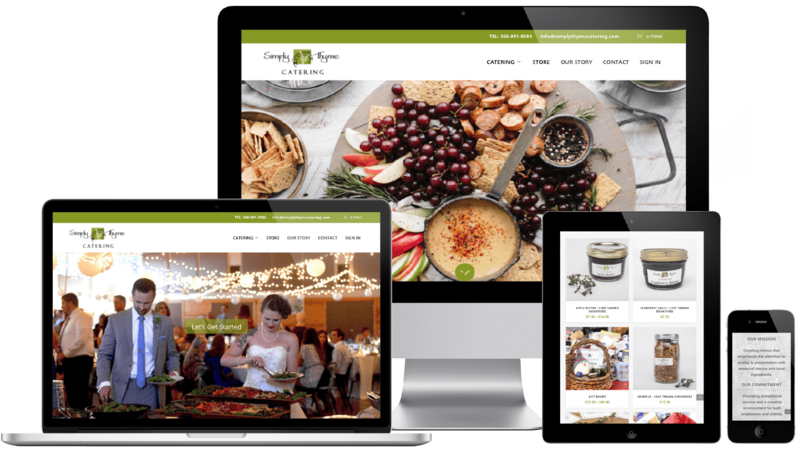 We created an efficiently elegant online store where Simply Thyme Catering could offer signature products and services and performed a search engine optimization (SEO) audit to help drive business to their website. In the end, Ichor worked with Simply Thyme Catering to design a website that reflected their business goals. More people are now able to connect with Simply Thyme Catering through their modern and easy-to-use online website and online store.